So, let´s get to the action! 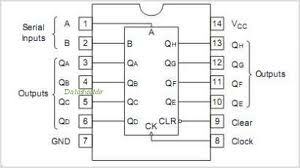 Here we have a simple example of the Shift Register for controlling a display. We are using the HD74LS164P (check the datasheet here) for this case (it´s a lot cheaper than the MAX used in almost all the tutorials, i bought 5 from ebay for a couple of euros) and also we are using a 4 digit 7 segment led display from SparFun. 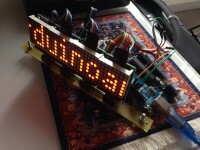 As you can see in the image above, a 7 segment led display is nothing more than some leds arranged in a particular position. You have 7 of them, and with that you can arrange to display the numbers from 0 to 9, a minus sign, and a few letters. See how each led it´s called by a letter, from A to G (we will be using this later). Our 4 digit led display is common anode, what does this means? 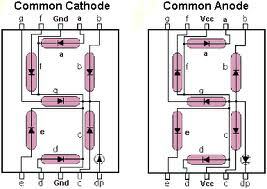 it says each digit and all of the 7 leds on each digit have a common positive (anode) and a separate negative (cathode). For our case, it´s better this way, so we will only need 4 resistors, one for each common annode on each character of the display. 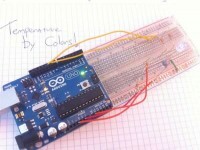 We are also using the Thermistor to check the temperature and send an analog value to our arduino UNO board, who will transform this analog data in a digital value and store it on a variable. We use this value to determine the number to be displayed. We are attaching it to Analog 0 in our Arduino Board.